John Clarke Hoyte painting. 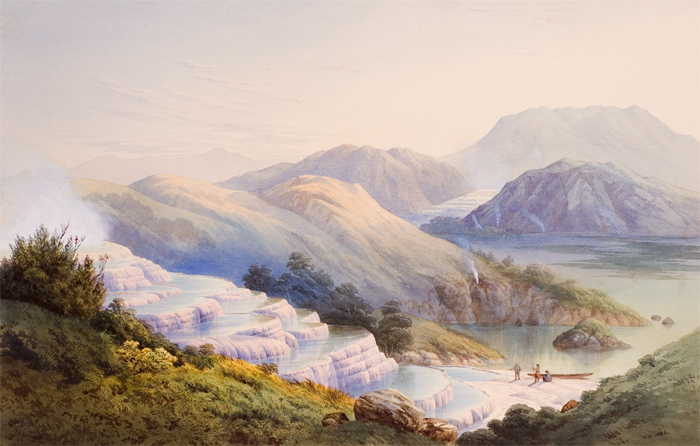 Pink and White Terraces, Lake Rotomahana and Mount Tarawera. Watercolor and gouache on paper. ca 1870s. Hocken Collections. Uare Taoka o Hakena, University of Otago. This is an unusual one: The pink and white terraces are an amazing place -- however they no longer exist. Actually, they no longer exist in the form that made them famous. The pink and white terraces were two sets of beautiful geyser formations of silica terraces in Lake Rotomahana near the dormant volcano Mt. Tarawera, around 25 km south of the New Zealand town of Rotorua, but they disappeared during an 1886 eruption of Mt. Tarawera. 800m apart, it is thought they had different appearances because of the amount of sunlight they each received, with the white ones being the larger set, around 50 layers and cascading over 40m in height, and the pink ones being the preferred area for swimming. In Maori they were known as Otukapuarangi, "fountain of the clouded sky" and they were a popular tourist attraction from the 1840s, especially after Prince Albert, the Duke of Edinburgh, visited in 1870, but were a source of racist resentment from the white (pakeha) New Zealanders because the Te Arawa tribe that owned them became wealthy from their control and ownership of the area (they even had their marae (meeting house) in Hinemihi made with gold florins instead of paua (abalone shell) eyes. After the eruption killed and displaced members of the tribe, the New Zealand government unfairly converted the area into crown land in a payment-for-relief-assistance system, although much of this (including 13 lakes in 2006) has been returned to the tribe in the past decades as part of the Treaty of Waitangi tribunal. Lake Tarawera before the eruption and today -- the eruption enlarged the lake. A narrow isthmus separates lakes Tarawera and Rotomahana. I've been fascinated with the pink and white terraces since I was a girl and saw a beautiful painting of them. It was only after a while that I learned that they had been destroyed -- I had dreamed of visiting them! In a marvel of modern science, the lowest two tiers of the pink terraces were rediscovered 60 metres underwater while mapping the lake floor in 2011, and it is thought that the rest may be buried under sediment, and the increased-level lake.